There are two ways to create a roadmap in Roadmunk: from scratch or using one of our customizable in-app templates. In this article, we look at how to create a roadmap from scratch. To create a roadmap from template, go to create a new roadmap from template. All Roadmunk roadmaps are created from your Roadmap Home. 1. Click the New Roadmap button (only appears when you have no roadmaps). 2. Click the NEW button at the top of the navbar and then select New Roadmap in the dropdown. IMPORTANT: Be careful not to confuse New Roadmap with New Master. Master Roadmaps roll up one or more source roadmaps into a single master that provides a higher level view of an organization's strategy. You can find out more about Master Roadmaps in our Quick Guide Master Roadmapping article. 3. 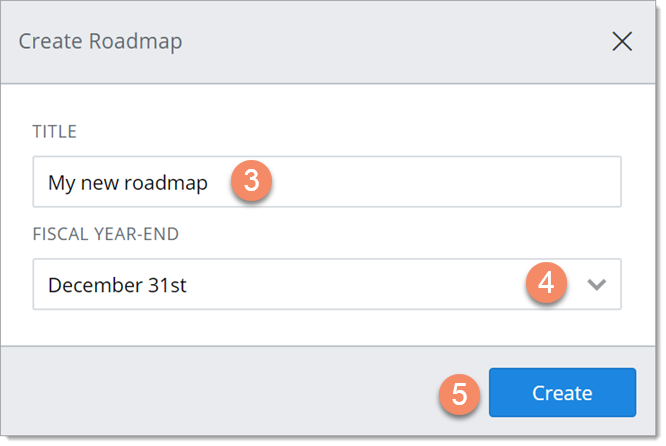 In the Create Roadmap dialog, enter a Title for the roadmap. TIP: The title should be short but descriptive. To differentiate it from similar roadmaps in the account, you may want to append your name or the name of your team or department. 4. Select a Fiscal Year-End. Unless your Account Admin has changed things, the default is December 31st (Calendar year-end). IMPORTANT: You can't change a roadmap's year-end after you save it. See Roadmaps and fiscal year-ends below to see how year-ends affect roadmaps. Here's a snapshot of the Roadmap screen and how it looks right after you create a new roadmap. 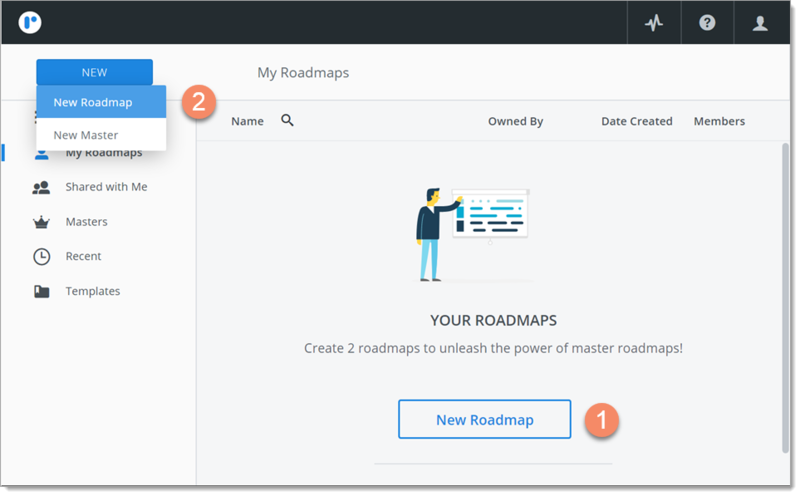 The Roadmap screen is where you work with roadmaps and their views. The Roadmap navbar contains tools to work with the roadmap that's currently open. Now, it's the roadmap you just created. Roadmap home icon. Takes you to your Roadmap Home, where you can open another roadmap or create a new roadmap. Roadmap dropdown. Rename, duplicate, and delete the roadmap. View dropdown. Gives you access to the roadmap's different views including the All Data view. All new roadmaps start out with a single default view named View 1. Add View button. Create a new view for the roadmap. Roadmap Sharing icons. Share the new roadmap with other users and, later, view share settings. The View navbar contains tools to work with the roadmap view that's currently open. Now and whenever it's a new roadmap, the open view is View 1. Items icon. Displays the Items Table in the roadmap viewing area (see 3 below). The table provides a tabular view of the items in the roadmap. Because you started from scratch, your roadmap has no data, and so the Items Table is empty except for the header row. Note that the Items Table has two default fields: Items and Date. All Roadmunk roadmaps must have these two fields, even if they have no values. Milestones icon. Displays the Milestones Table, where you can add and view milestones. Same as the Items Table, the Milestones Table is empty when you create a roadmap from scratch. Visualize button. Create the visualization for View 1. Each roadmap view can have only one visualization: a Timeline or a Swimlane. The button is displayed on the navbar only if the open view does not yet have a visualization. TIP: To add more visualizations to a roadmap, create new views. Add Item button. Create and add individual items to the roadmap from scratch. Import, Filter, Export, and Settings icons. Import items into the roadmap, add filters to the open roadmap view, export roadmap items, and change view settings. Now is probably a good time to use the Settings icon to rename the default view to something other than View 1. The roadmap viewing area is where roadmap data is displayed. The data set that's displayed and how it's displayed depends on which roadmap view is currently open and whether the view's Items Table, Milestones Table, or visualization is selected. In all new roadmaps created from scratch, View 1 is open with the Items Table selected, and the table is empty until you start adding items. 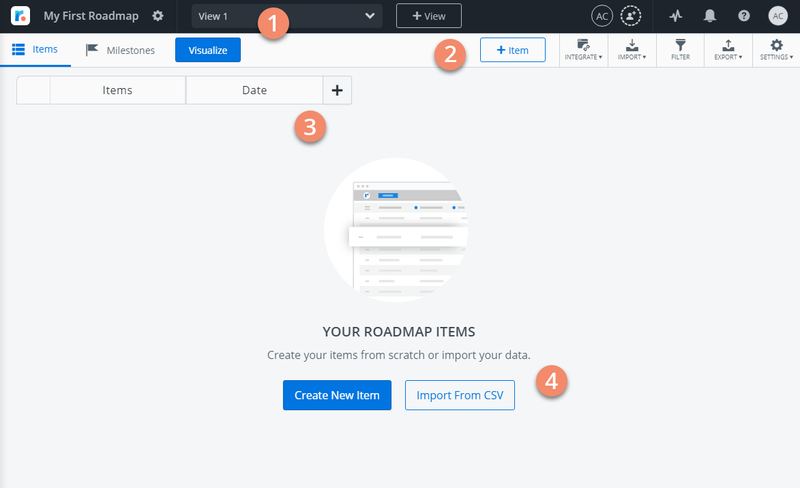 The Create New Item and Import from CSV buttons make it real easy for you to adding items to your roadmap right away. For help on this big next step, see Create and import items in our Getting Started tutorial. Who can create a roadmap? To create a roadmap in Roadmunk you must be a Collaborator. Collaborator is one of the three user roles in Roadmunk. Collaborators can create and own roadmaps, edit and delete their roadmaps, share their roadmaps with other users, and view, comments on, and edit roadmaps that are shared with them. Every roadmap in Roadmunk has an Owner. The person who creates a roadmap automatically becomes its Owner. As a roadmap Owner, you have special permissions that no other user has. You can share your roadmaps with other users and edit sharing settings. You can reassign ownership of your roadmaps to other users. And you can delete your roadmaps. Why do roadmap year-ends matter? It's very important that you set the correct year-end for a roadmap at the time you create it. You cannot change the year-end after the roadmap is saved. A roadmap's year-end affects how the roadmap's Timelines will appear. If the roadmap has a Fiscal year-end (not December 31st), you can select whether the timeline displays the Fiscal year-end or the Calendar year-end. In addition, while calendar months always appear on timelines, setting a Fiscal year end will determine where Quarters, Halves, and Years are displayed in relation to the timeline. Roadmunk accounts start out with December 31st as the default year-end. If your organization uses a Fiscal year-end, your Account Admin can change the default year-end accordingly so you don't need to worry about selecting the right one.